Plants perennial; cespitose, neither rhizomatous nor stoloniferous. Culms 40-100 cm, erect, sometimes geniculate, not rooting, at the lower nodes. Basal sheaths villous; upper sheaths glabrous, densely villous or densely tomentose, or sparsely to densely hairy, with papillose-based hairs; ligules (1)1.5-6 mm, entire or lacerate, not ciliate; blades 2-12(18) cm long, 2-5(7) mm wide, glabrous or the adaxial surfaces sparsely to densely villous or tomentose. 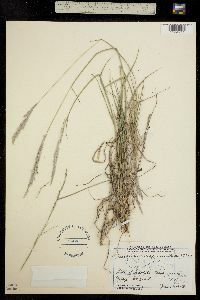 Panicles with 4-10 spikelike primary branches on 5-10 cm rachises, rarely with secondary branches; primary branches 3-6 cm, appressed to ascending, axes not wing-margined; internodes 2-5.5 mm (mid branch), with spikelets in unequally pedicellate pairs;secondary branches rarely present; pedicels not adnate to the branch axes; shorter pedicels 0.1-0.3 mm; longer pedicels 1-2 mm; terminal pedicels of branches 1.7-6(7) mm. Spikelets homomorphic, (3.7)4-7.5 mm (including pubescence), 3-5.4 mm (excluding pubescence). Lower glumes 0.4-0.6 mm; upper glumes 2.5-5.1 mm (excluding pubescence), narrower than the upper florets, 3-veined, densely villous, hairs 1.5-5 mm, silvery-white to purple, widely divergent at maturity; lower lemmas 2.7-5 mm (excluding pubescence), pubescence exceeding the upper florets by 2.2-4 mm, 7-veined, veins unequally spaced, only the 3 or 5 central veins visible, margins and outer lateral veins densely pubescent, hairs 1.5-5 mm, silvery-white to purple, widely divergent at maturity, intercostal regions glabrous, apices attenuate (acuminate); upper lemmas 2.5-3.4 mm, ovate-lanceolate, brown to dark brown, acuminate. Caryopses 1.3-2 mm. 2n = 36, 54, 70, 72. Digitaria californica grows on plains and open ground from Arizona, southern Colorado, and Oklahoma through Mexico and Central America to South America. The name reflects the fact that the first collection was made in Baja California, Mexico. Plants in the Flora region belong to D. californica (Benth.) Henrard var. californica. They differ from those of D. californica var. villosissima Henrard in having densely villous, rather than densely tomentose, leaves. Perennials, Terrestrial, not aquatic, Rhizomes present, Rhizome short and compact, stems close, Stems nodes swollen or brittle, Stems erect or ascending, Stems caespitose, tufted, or clustered , Stems terete, round in cross section, or polygonal, Stem internodes hollow, Stems with inflorescence less than 1 m tall, Stems, culms, or scapes exceeding basal leaves, Leaves mostly cauline, Leaves conspicuously 2-ranked, distichous, Leaves sheathing at base, Leaf sheath mostly open, or loose, Leaf sheath smooth, glabrous, Leaf sheath hairy, hispid or prickly, Leaf sheath and blade differentiated, Leaf blades linear, Leaf blades 2-10 mm wide, Leaf blades mostly flat, Leaf blades mostly glabrous, Ligule present, Ligule an unfringed eciliate membrane, Inflorescence terminal, Inflorescence solitary, with 1 spike, fascicle, glomerule, head, or cluster per stem or culm, Inflorescence a panicle with digitately arranged spicate branches, Inflorescence with 2-10 branches, Inflorescence branches 1-sided, Lower panicle branches whorled, Rachis angular, Flowers bisexual, Flowers unisexual, Spikelets pedicellate, Spikelets dorsally compressed or terete, Spikelet less than 3 mm wide, Spikelets with 1 fertile floret, Spikelets with 2 florets, Spikelet with 1 fertile floret and 1-2 sterile florets, Spikelets paired at rachis nodes, Spikelets all alike and fertille, Spikelets bisexual, Spikelets disarticulating below the glumes, Spikelets secund, in rows on one side of rachis, Rachilla or pedicel glabrous, Glumes present, empty bracts, Glumes 1 clearly present, the other greatly reduced or absent, Glumes 2 clearly present, Glumes distinctly unequal, Glumes equal to or longer than adjacent lemma, Glume equal to or longer than spikelet, Glume surface hairy, villous or pilose, Glumes 3 nerved, Glumes 4-7 nerved, Lemmas thin, chartaceous, hyaline, cartilaginous, or membranous, Lemma similar in texture to glumes, Lemma 5-7 nerved, Lemma apex acute or acuminate, Lemma awnless, Lemma margins thin, lying flat, Lemma straight, Palea present, well developed, Palea membranous, hyaline, Palea about equal to lemma, Stamens 3, Styles 2-fid, deeply 2-branched, Stigmas 2, Fruit - caryopsis, Caryopsis ellipsoid, longitudinally grooved, hilum long-linear.